Well located for shopping, 465 and lovely lake and excellent service in the dining room. It was a smoking room. Nice upscale rooms, comfortable beds and sheets. Nice showers and bathrooms. Convenient to restaurants and mall. Close to fantastic Sunday breakfast place. Very helpful staff, good backroad directions for concert venue & church. Their exercise room was in need of repair and update. The Marriott Indianapolis North was extremely incredible. From the check-in service to house keeping. The rooms were very clean and the location of the hotel was central to everything from dining to shopping. Not to far from the highway; which was a plus for us since we were back and forth? 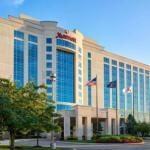 If ever in the area again, I would definitely stay at The Marriott Indianapolis North! The 315-room Marriott Indianapolis North provides luxury accommodation at an affordable price for both the business traveler and families on vacation. Items included in the room rate at this 11-story, non-smoking hotel are local telephone calls, a morning newspaper, parking and coffee available in the lobby 24/7. There are 10 meeting rooms available for social or business functions. The largest can accommodate 650 guests. Area landmarks and attractions include three golf courses, the Indianapolis Motor Speedway, Indianapolis Arts Garden, Conner Prairie, the Indianapolis Museum of Art, Indianapolis Zoo, the Childrens Museum and CineDome, Victory Field, Eitlejorg Museum and The Fashion Mall. All the guestrooms have a work desk with high-speed Internet access, Internet browser television with cable movie and news channels, pay-per-view movies, alarm clock, tea and coffee making facilities, pullout-sofa bed, iron and ironing board, bathrobes, hairdryer, and two-line telephone with voicemail and speakerphone. The hotels Bistro 33 is open for breakfast, lunch and dinner and room service is available from 6am until 11pm. Restaurants nearby include Champps Americana, Sullivan's Steakhouse and the keystone grill. The hotel has an indoor swimming pool, whirlpool and a fitness center. The 24-hour front desk has safe deposit boxes. Other amenities include a concierge desk, full service business center, on-site laundry, vending machines and a gift shop and newsstand. Several guests said this is the best hotel to stay in on the north side of Indiana. The rooms are well furnished, spacious, clean and comfortable. Many enjoyed rooms with a view over the lake. Those who had breakfast at the hotels Bistro 33 were well pleased and said it was reasonably priced. The employees were praised for being friendly and efficient. Most clients say they will use this hotel again and would recommend the property to others.